This is a brand new feature on Tasty Chicago. Each month, I will highlight a homemade meal by one of the top cooks in this country, my wife. 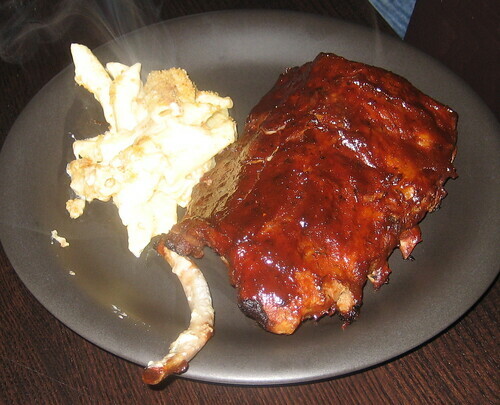 She makes a darn good rib (I don’t prepare food by the way, even manly stuff like barbecued ribs, more on that later). Check out that bone on the lower left, that just fell off this half slab as I transferred it from tray to plate. You can probably tell that I am not one to pass up the charred flesh of an omnivorous domesticated hoofed mammal, especially with a spicy red sauce of some sort. Throw in fall-off-the-bone friendliness as exhibited above, and I’m in hog heaven, suuuuwwwweeeeeeee. I had this plate of ribs (that’s her mac and cheese on the side also) during the Bears/Saints playoff game last weekend. It actually takes my wife about 48 hours to make the ribs. This session started on Friday night when she tore the thin membrane from the underside of the ribs, put a dry rub on, wrapped them in cellophane, and put them in the ‘fridge overnight. On Saturday afternoon, she took them out of the cellophane and popped them in a cooking bag with about a cup or so of water and spices. She sealed the bag, put a few slits in it, then cooked it for around 2.5 to 3 hours at maybe 300 degrees. Then she sauced them and wrapped them again for another night in the ‘fridge. On Sunday, at about the end of the first quarter, she sauced them up again, then put them in the oven for about 30 minutes at 400 degrees, and they were ready by halftime. The sauce is different every time. She combines a few different store-bought sauces with various spices. I don’t know, they’re just always good. I’m talkin’ really good. This recipe was actually inspired by my brother, so there you go Jim, here’s to giving you some credit. And to D-man, you inspired the “charred flesh” comment in para 2, thanks for that. Kind of inspires me to cook…well…maybe not. I mean, I’m a writer, not a cooker. Posted in food on 2007/01/26 by John.